Five years ago today, I was very pregnant with my second son. JSL had not gotten the memo that he had been given eviction orders. He decided that it was not in my best interest to come Mother’s Day weekend when my favorite doctor was on call. Instead, I spent Mother’s Day 2007 hot, uncomfortable, and wishing I was holding my baby boy. Of course, the joke was on me when I realized that I had been in labor all during Mother’s Day and just blocked out a lot with sleeping in front of the AC unit. Now, I am the mother of two beautiful and amazing boys. NHL and JSL keep me on my toes, make me laugh, and treat me like the princess in our house ….most of the time. 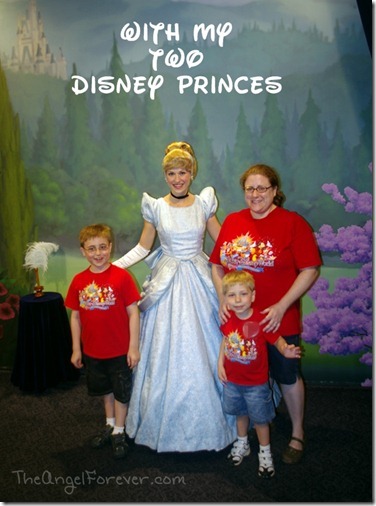 It only seemed fitting to jump into a photo with Cinderella and my two little princes. Now, I will leave you with a special Mother’s Day message from Disney Pixar and the characters from Brave. Happy Mother’s Day to my mother, mother-in-law, grandmother, aunts, sister-in-laws, cousins, other family members, friends, and all women. May your day be filled with many wonderful memories. Disclosure: Disney PR notified me of the Mother’s Day Brave featurette. I was not compensated for this and simply wanted to share since I adore all things Disney. You know we will be going to see Brave when it is released June 22, 2012. I love the Brave Mother’s Day trailer, made me cry!! !